Yesterday I posted footage of what appeared to be a scale model of a jet airliner flying around the inside of a warehouse. It appeared to defy gravity. Whether that footage was for real or not, this post is the real deal, a fabulous large scale model of the Airbus A-380 flown at a 2013 modeler's meeting in Germany. It is only due to today's technology that this is possible, a far cry from my own modeling days when together with my son, we flew large scale piston engined aircraft at Sunday afternoon club meetings. Is This For Real Or Some Sort Of Trickery? If anyone still hasn't decided what to buy me for Christmas yet, then this will do nicely - pretty please! After further research it appears these are Electric Ducted Fan, (EDF) super models, and can also be flown outdoors. Below is an earlier flight of the same model. As we approach the Christmas Holidays and the end of 2014, a year that held many occurrences for us that should be forgotten, we look forward to 2015, and in early Spring our 4th visit to India. This trip has a 3 weeks duration, with a privately arranged tour in the North for the first 10 days, before flying on to Mumbai for a full week's stay in the luxury of one of the Vivanta by Taj Hotels there, allowing us to further explore this amazing city in more detail. We then fly south to "God's Own Country" - Kerala for a further week's stay again in the fabulous Taj Malabar. This trip we fly in to Amritsar and fly out again from Cochin, having travelled the full length of the country during our stay. One of the highlights of our tour of the north will be a 60 mile, 5 hour trip on the Shimla to Kalka railway, known locally as the "toy train" due to it being a narrow gauge railway. This hill railway was built by the British during the Raj, 100 years ago when Shimla was transformed into the "place to be seen" holiday resort in India due to its location in the foothills of the Himalayas, giving it its temperate climate. We are booked with 1st class tickets. The cost of the 60 mile journey? £2 per person each way, 10 times the normal standard class rate! We will only make the journey to Kalka after our stay in Shimla. Our first class trip will also provide us with unlimited tea, and food served by waiters. 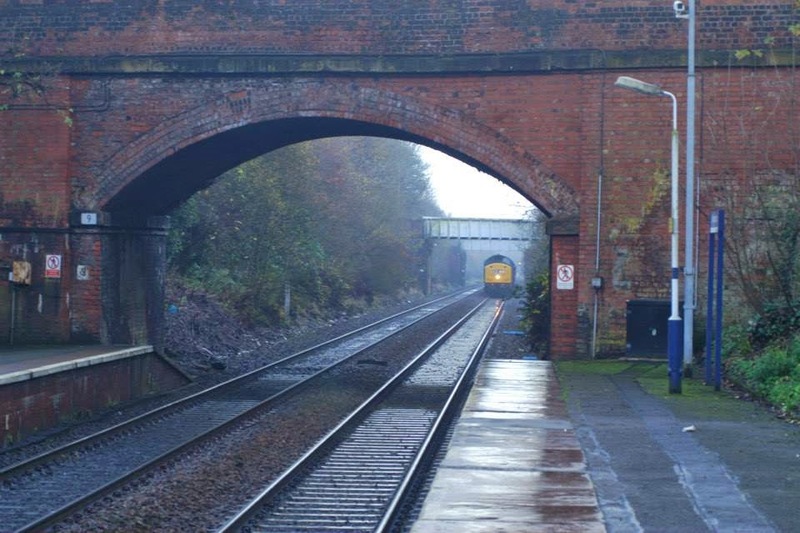 A one hour documentary of the railway was made by the BBC in 2010, and can be seen here. The scenery should be magnificent. The New Yamaha Delight 115cc Motor Scooter. 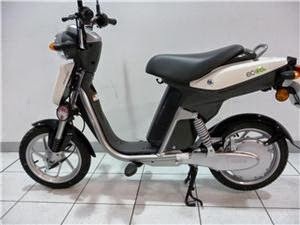 Readers who may be researching vehicles to use with their motorhome once they have reached their destination may have already read my experiences with our Yamaha EC-03 electric scooter here: Living with the EC-03. We have now used this high quality little Yamaha during our motorhome trips throughout last Summer, and although at 56kg and carrying no liquids, it has lots of advantages for this type of use, its very limited range lets it down for us somewhat. I have extended that by fitting LED bulbs all round, (the lights are permanently on when riding, for safety), but at its maximum 28mph I can still only achieve around 15 miles or so, with a 7 hour charge time in between. More range is available if used in the low power mode, but that is really slow, and in my own opinion then has issues when used on open roads midst other, faster moving traffic. As I indicated at the end of my post about the EC-03, in our own circumstances I would have been better with the new Yamaha Delight as it would offer much more versatility. I have now bought one ready to use next season. At 98kg wet weight, it just about fits within the maximum payload allowance I have for the rear garage of our motorhome, leaving a margin of around 52kg to spare before we reach our total maximum allowed payload above the weighbridge certificate I obtained during Summer when we were fully loaded, less the EC-03. Height is also a consideration, with a maximum locker door height of 1040mm, with more available once inside. 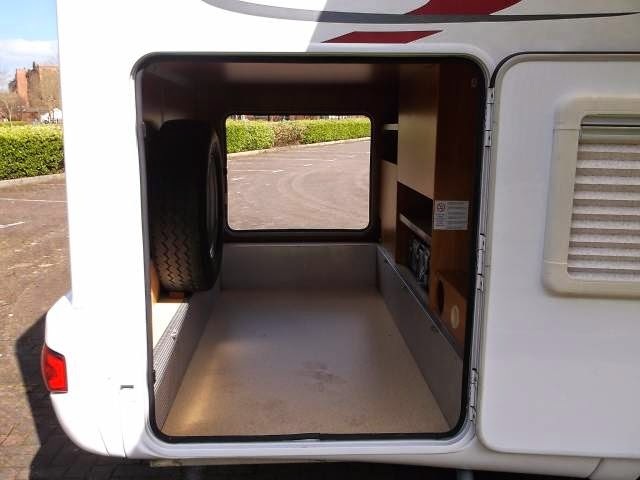 The Delight fits through the door with a few cms to spare at the handlebar once the mirrors are removed, and the angle of the loading ramp comes into play. 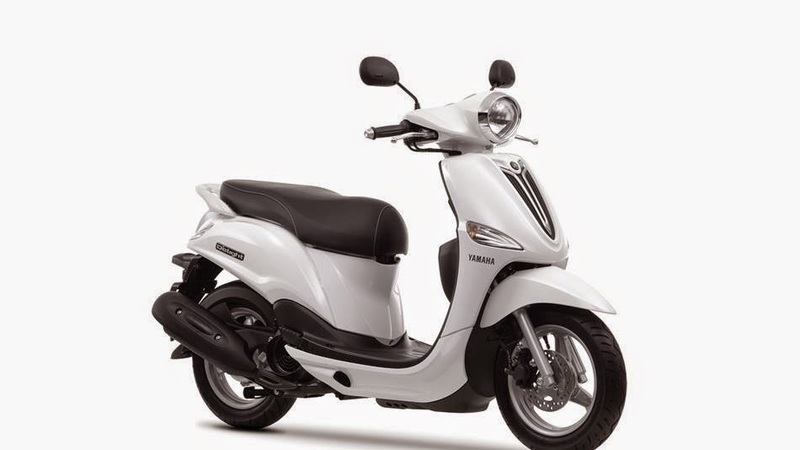 The Delight is a 115cc 4-stroke scooter, and is by design very small and light-weight for its class. Being that size of engine, the UK rider must hold either a full motorcycle license or at least a provisional one with a CBT, (Compulsory Basic Training), pass. It has a top speed (one-up) of around 55mph. I have acquired a lightweight aluminium motorcycle loading ramp to get it into the storage locker (which we tried at the Yamaha dealership before finalizing our purchase), and it fits fine, except it obviously takes up more room than the EC-03 did. It is also relatively easy to get in there, but is easier if two people are involved in the process if just to guide it in. Once at our destination, as the bike has a large comfy dual seat, I expect it should be able to cope with trips into the city two-up without having to tidy everything up within the camper in order to use that. If you think this might be an idea you could use (I don't like the idea of towing cars - too many regulations for one thing - particularly in Europe), then the Yamaha website, with all the tech-specs can be found here: Yamaha Delight Specifications. I went for the metallic creamy white version. Most scooters in Spain are white! 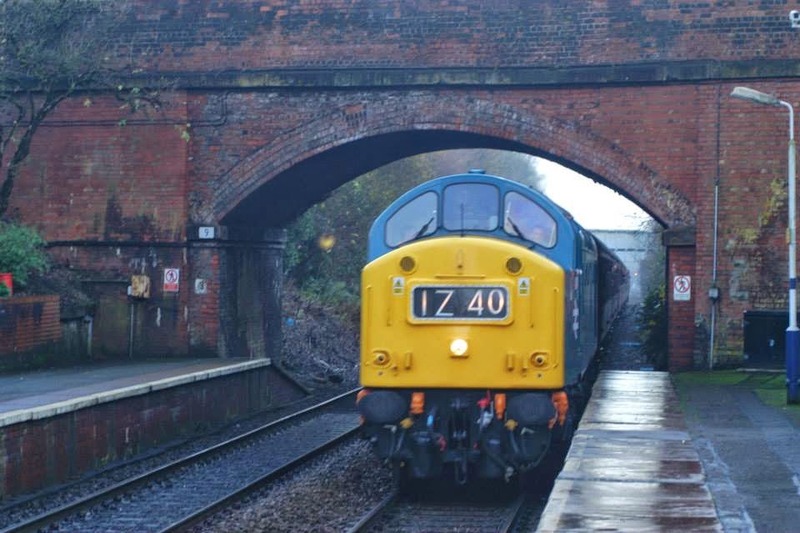 On Saturday 29th November we had an excellent full day out with two friends courtesy of Compass Tours By Rail who provide day excursions all over the UK using historic locomotives and rolling stock. Our transport for the day arrives to collect us. Our tour, starting and ending in Southport, collected us from Westhoughton Station at 9.20am and took us via the "scenic route" to York to visit the St. Nicholas Christmas Markets, and what a full on, busy day it was. After settling down into our comfy seats around our own table, it was bacon butties from the buffet car, where all manner of food was available as well as hot drinks. The train was also carrying copious amounts of real ale courtesy of Southport Brewery. 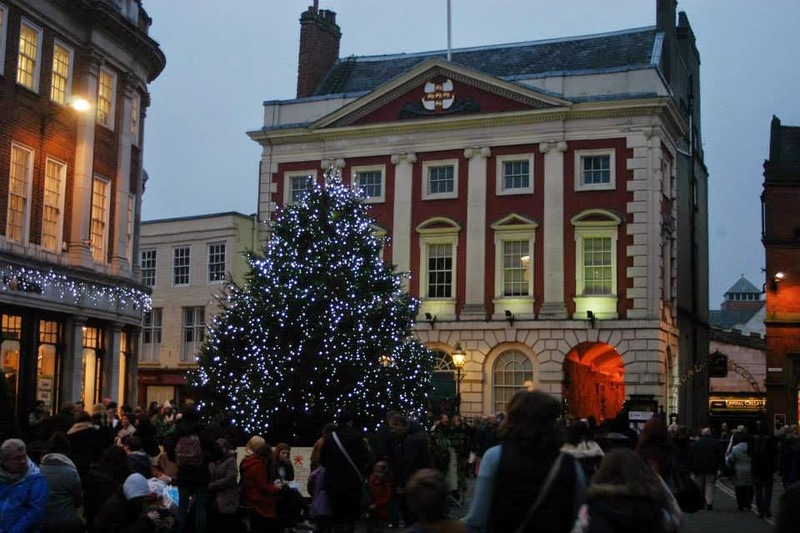 We arrived in York at 12.10pm and enjoyed 6 hours exploring the city, which allowed shopping for the ladies, historic sightseeing, lunch out, and everything else this city has to offer, while others chose to stay on the train for an additional 4 hour tour to Saltburn and back to York. We re-boarded our privately chartered train at 6.15pm ready for our 6.30pm departure, arriving back at Westhoughton at 9.20pm. 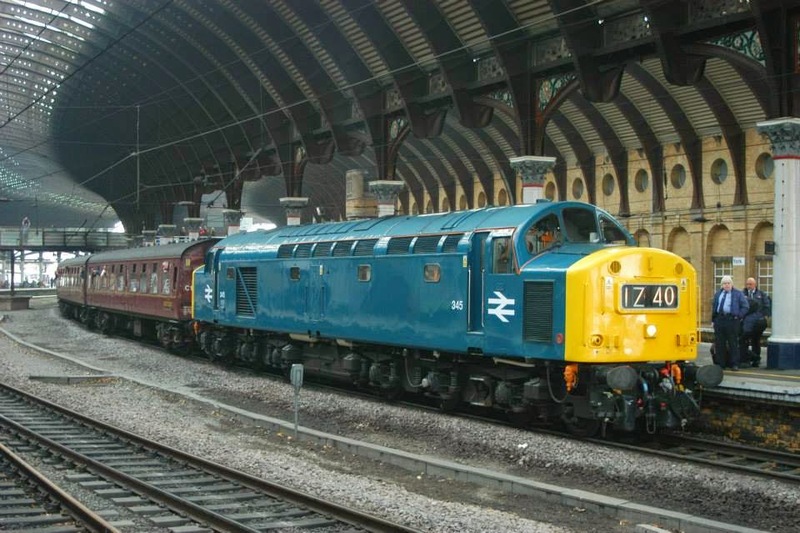 The locomotive used on this trip was Class 40 diesel 345 in BR blue livery, immaculately turned out by its owners, the Class 40 Preservation Society, who own two of these which are kept at Bury on the East Lancashire Railway. Only this example holds mainline certification though. This type of locomotive became famous when its sister locomotive, D326 was stopped by Ronnie Biggs, Bruce Reynolds, Buster Edwards and others as they robbed it in Buckinghamshire in 1963 while hauling a mail train, which infamously became known as "The Great Train Robbery". 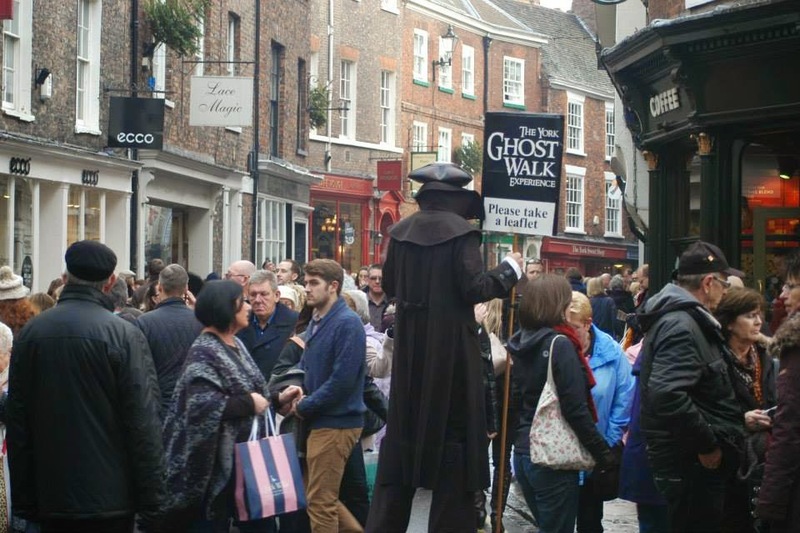 York was "buzzing" all day. And as darkness fell the Christmas atmosphere grew. We can highly recommend one of these trips, this was our second. A great day out, with an interest for everybody.